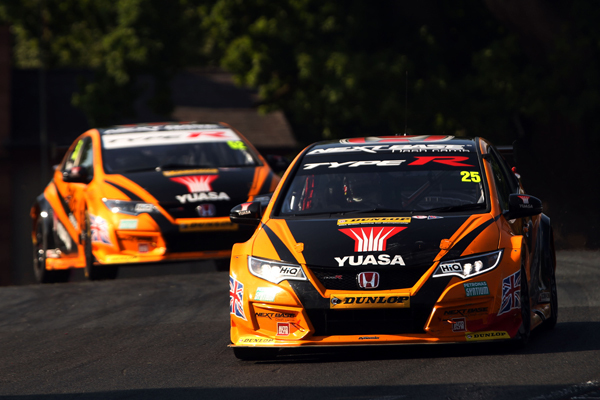 Halfords Yuasa Racing team-mates Matt Neal and Gordon Shedden are heading to Croft for the next outing on the 2016 Dunlop MSA British Touring Car Championship calendar with a strong haul of points firmly on their hit list. Having claimed a commanding victory in the most recent race at Oulton Park - his second of the season behind the wheel of the potent Honda Civic Type R - Neal travels north-east just a single point adrift of the top of the Drivers' classification. The three-time champion boasts a stellar record at Croft, with six successes to his name. Shedden, meanwhile, celebrated his 100th BTCC podium in North Yorkshire last year during the course of an impressively consistent weekend, and the Scot is primed to make his milestone 300th start in the series 12 months on. The defending title-holder currently sits fourth in the Drivers' chase following a puncture in the final race at Oulton that robbed him of the runner-up spoils, with Halfords Yuasa Racing only one point shy of the lead in the Teams' classification and Honda right in the fight for Manufacturers' glory. "Croft is a circuit I've always enjoyed; I love how close the fans get to the action there - they can really smell the burning brakes and rubber, which makes for a fantastic spectator experience. You need a good all-round package underneath you at Croft -traction in the slow-speed sections, agility through the tight-and-twisty parts and stability for the fast corners out the back, which call for a lot of commitment. They are all areas in which the Civic Type R scores highly, and we had a positive and productive test at Rockingham earlier this week which enabled us to get a solid handle on the car. If you look at how competitive it is in the standings, every point is critical this year - all it takes is one hiccough to send you tumbling down the order - so it's essential that we stay focussed and continue consistently racking up the results." "Historically, we've gone pretty well around Croft; like Oulton, it's a circuit that tends to favour rear wheel-drive cars, but we've generally led the way amongst the front wheel-drive brigade. There was some great racing there last year, and I'm sure we can expect more of the same again. It's a fun circuit with a real mix of corners, which makes perfecting the car's set-up quite a challenge - but one that I relish. Given how fiercely-disputed the BTCC is right now, every weekend is pivotal - it's incredible to think we've already had nine different winners from the first 12 races! With that in mind, we have to be targeting three strong points finishes, which we would have had at Oulton but for the late puncture in race three. The cards haven't particularly fallen my way in that respect recently, so hopefully we can turn that trend around."